We have partnered with the crew at Aceable to provide you with the best Texas approved adult driver education course available. Aceable has helped thousands of new drivers like you get on the road quickly and safely, with very affordable prices. With approval from the state of Texas and the TDLR/TEA, this course is accepted anywhere you might be in the state. Once you receive your certificate, bring it with you to your local DPS office to take a quick vision and driving test and you will be on the road in no time. Helpful Tip: It is recommended that you call and schedule an appointment for your driving test to avoid the long lines that are often found at DPS locations. Providing an affordable option for you to complete your adult drivers ed is very important to us. We also understand that everyone has a different schedule these days so we make it convenient. You can take your course in the middle of the night if it is best for you and we are available night and day to help with any questions you may have along the way. This course allows you to log on and off, breaking the course into smaller sections, all while saving your progress. The best part about successfully completing this course is that you won't be required to take the written test at the DPS. This rule applies to first time drivers aged 18-24 as well as drivers 25 or older seeking to obtain a Texas drivers license. Increasing your driving knowledge and getting out of a typically required test is a win-win. Although there is no need to take the written exam at the DPS, the state of Texas requires that the course itself ask questions to ensure that the person taking it is paying attention to the information presented. Just like the test at the DPS office, you will have to pass these quizzes with a score of 70 or above. The good news is that the questions are all multiple choice and asked shortly after the answers are covered in the course. More good news. Even if you don't pass the first time, you will be given an opportunity to try again. Your success is virtually guaranteed! When it comes time to get your license the last thing you want to do is get a ride to go take your drivers ed somewhere. The good news is that this course is approved for new Texas drivers and available 100% online. 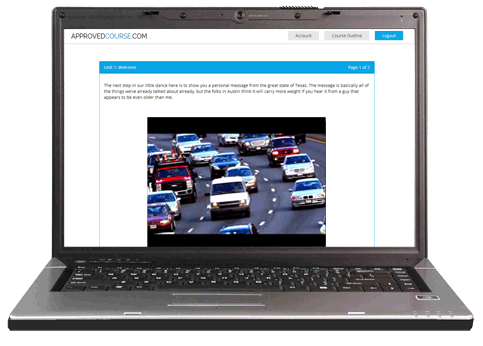 Texas Adult Drivers Ed is Available 100% Online!